The Elton is the ultimate at home office with summerhouse looks, but a heavy duty construction. Installation is £200 and is payable on day the shed is installed. Installation is £220 and is payable on day the shed is installed. Installation is £240 and is payable on day the shed is installed. Installation is £235 and is payable on day the shed is installed. Installation is £270 and is payable on day the shed is installed. Installation is £255 and is payable on day the shed is installed. Installation is £285 and is payable on day the shed is installed. Installation is £320 and is payable on day the shed is installed. Click for information about delivery and access. There are 3 delivery zones, based on the distance to your delivery address. If you need a delivery outside these zones, you will need to contact us BEFORE you make a payment online to arrange a custom delivery. The second measurement is always the gable size, which is the shaped end. If access to your property is limited this may affect delivery/installation and extra charges may apply. Please refer to our access guide in Buying a Shed. 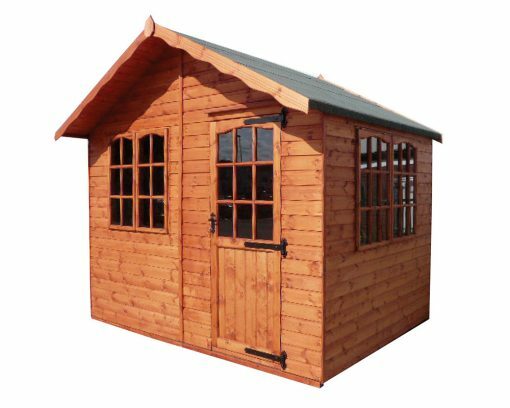 We recommend that you read our guide to Buying a Shed prior to purchase and have read and understood our Terms and Conditions.